Move over avocado toast. 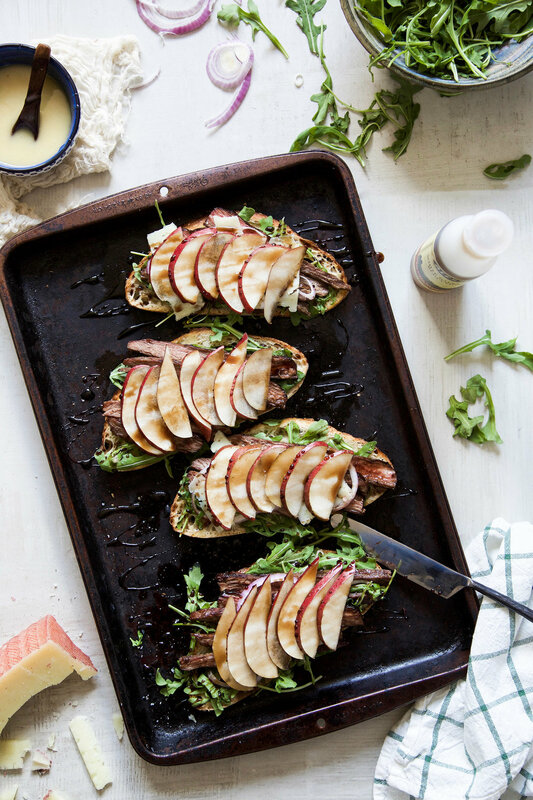 The open-faced sandwich is coming in hot and heavy to take your place as reigning Instagram queen. But I mean, for real, though. Do you see this beautiful mess?! It has Insta-worthy written all over it. It also happens to have “delicious, heavenly and I-could-eat-this-every-day” written all over it. 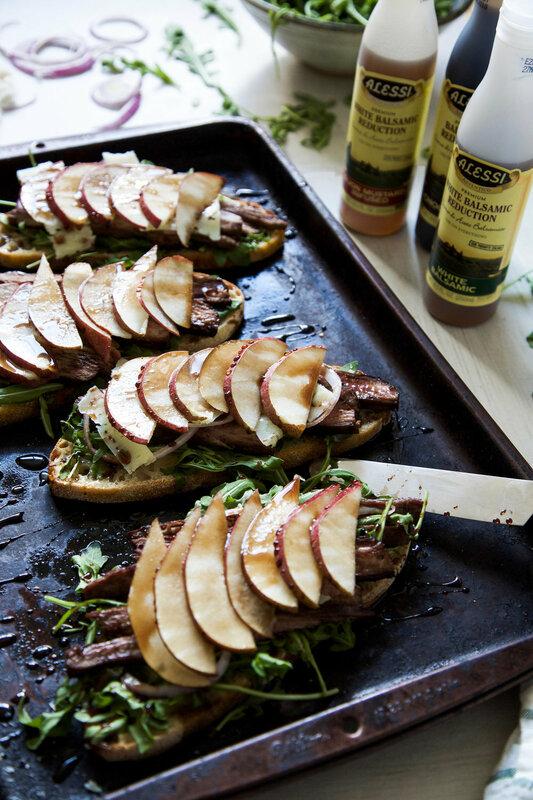 With marinated steak, pear, manchego cheese and Alessi Balsamic Reduction drizzled all over it, it’s easy to see why. The open-face aspect makes these beauties look like they’re complicated to assemble, but I promise they’re far easier than picking an Instagram filter will ever be. The steak marinade is a simple one inspired by my favorite marinade recipe that my grandma has been making for years. I made a few adjustments to it, namely switching out brown sugar for a little of the Alessi Chocolate Balsamic Reduction (I know it sounds weird, but cocoa + steak = one of the best flavor combos ever, I promise! However, it’s also really good with the Dijon reduction.) In case you’re wondering, reductions are simply a liquid (such as vinegar) that have been boiled down into a thick sauce with more robust flavors. Some reductions have added sugar, additional ingredients or even thickeners. However, Alessi keeps their reductions free of any of those nasty thickeners and fillers. The resulting sauce is one that isn’t too heavy but instead just right for drizzling and/or mixing into other things, such as marinades or sauces. Now, my only questions are why have I not been putting Alessi’s balsamic reductions on everything (Because they literally make everything taste better!) and why is every sandwich not an open-faced sandwich? I’m telling, y’all, game changers. Game. Changers. Get involved! How do you guys cook with balsamic/balsamic reductions? Let me know in the comments below! In a small bowl, whisk together all marinade ingredients. Place the steak in a zip-lock bag or a glass baking dish and pour the marinade on top. Seal the bag, or cover the pan tightly, with plastic wrap, and place in the refrigerator for at least 30 minutes, or up to overnight (the longer it sits, the better it tastes). While the meat is marinating, place the bread on a baking sheet, drizzle with olive oil and toast in a 350-degree oven, for about 10 minutes or until golden brown. As the bread is toasting, whisk together the mayonnaise and balsamic reduction to create the aioli. Set aside. Once the meat has finished marinating, place a grill pan or cast iron skillet on a medium-high heat burner. Allow to heat for a few minutes, then spray the pan lightly with cooking spray and place the steak on. Cook for 3-4 minutes, then flip the meat and cook another 3-5 minutes, or until the meat is cooked to your liking. Remove from the heat and place on a cutting board. Allow to cool for a few minutes, before thinly slicing it. To assemble the sandwiches, spread aioli on the bread. 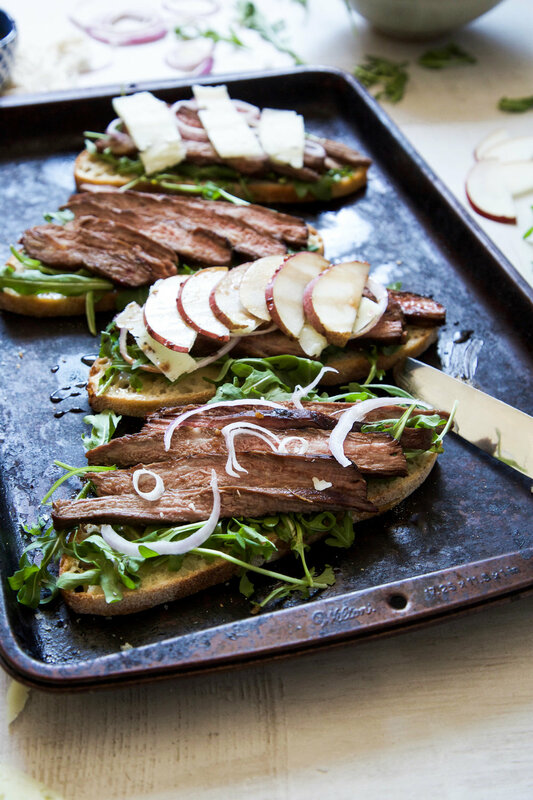 Top with arugula, then add on a few slices of steak, some red onion, 3-4 slices of manchego cheese, pear slices and finish with a balsamic reduction drizzle. Enjoy!